Kids 4 Kids presentations are educational, high energy, informative and fun. Scott Graham explodes onto stage, captivating his audiences with his passion for learning and leadership. It is unbelievable how quickly Scott Graham connects to students, inspiring them to find their inner leader and to inspire others with their own life lessons. Kids 4 Kids literacy presentations inspire students to read and write. Scott Graham uses his struggles with reading and writing to captivate the imagination of students and help them find their inner writer. Scott is the author of six best selling books, has produced a DVD, and is a singer/song writer. He is also an individual who struggled with reading and writing as the result of having ADHD (Attention Deficit with Hyperactivity) and a learning disability. Scott realized at an early age that having ADHD and a learning disability was a gift and not an obstacle. He uses his story to inspire students. He also discusses the process of writing a book and how editing can be your best friend. 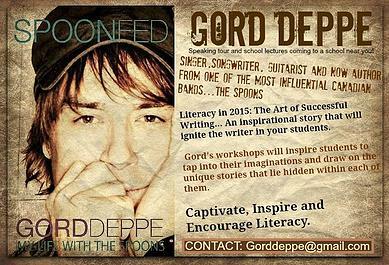 Gord Deppe, from the rock group, “The Spoons,” has combined efforts with Scott Graham to create an incredible literacy presentation for intermediate students. He talks about how writing music became his voice that led him not only to write songs, but also to pen a bestselling book entitled, “Spoonfed.” Gord brings his guitar with him and entertains students and staff with acoustic versions of his top ten hits and talks about his experiences with bands like the Police, Culture Club and Simple Minds. Both Scott and Gord would love to come to your school, meet your students and staff and put on a presentation you will not soon forget. They can be booked individually as well. If you are interested in a combination of a leadership/anti-bullying presentation, this can be arranged. The Kids 4 Kids Classroom workshops are designed to teach students leadership skills. The first session helps define leadership and the characteristics of a leader. These include: Respect, Responsibility, Initiative, Integrity, Honesty and Trust. The second and third sessions discuss anti bullying strategies and the four session discusses anger management and peer pressure. Each session is an hour in length and designed to help develop a positive classroom environment and encourage students to develop their skills as leaders by helping other students with what they have learned. The sessions are interactive and fun. bullyfreeME presentations: Every parent wants to protect their children from bullying. Scott Graham has spent the last 25 years helping students, staff and parents learn usable anti bullying strategies. Educated at the University of Waterloo, Scott has created a workshop that is powerful and useful. During this workshop Scott defines the difference between being mean and bullying, and what children are presently being taught. Parents learn usable anti bullying strategies that can be applied in the playground and online. Scott uses powerful stories that teach the importance of helping children become resilient and empowering them with anti bullying strategies that work. Summer Camp Workshops: Scott Graham has created a summer camp staff workshop that is incredible. It includes programming ideas, campfire programs, teaching leadership to children and anti bullying strategies. It is a must for every camp staff.